This style of rolls is often referred to as monkey bread, but may also be called Hungarian coffee cake, bubble loaf, or pull-aparts. A long time ago I made cinnamon orange monkey bread that used frozen bread dough rolls. I have also tried recipes that used refrigerated biscuits. I wanted to give monkey bread a try using homemade sweet dough. And at the last minute I decided to add dried cranberries since I love them paired with orange flavor. Since I am not a morning person, I wanted to make these up the night before and then bake them in the morning. Not having tried this before with homemade sweet dough, I wasn’t sure if it would work to refrigerate them overnight. Luckily it worked great and the monkey bread turned out wonderfully. I thought it tasted better using the homemade dough than the frozen dough, but if you are short on time the frozen bread dough rolls are a great option. If you use frozen rolls, thaw 18 rolls and then cut them in half. 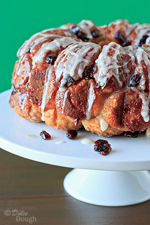 Homemade sweet dough, orange zest, and cranberries make this overnight monkey bread extra special. 1. Attach dough hook to stand mixer and in the mixer bowl combine 2 cups of flour, yeast, sugar, and salt.2. Heat milk on a low power in the microwave until lukewarm (120°F-130°F).3. Add the warm milk, 1/4 cup butter, and egg to the flour mixture and mix at low speed until ingredients are combined, scraping sides of bowl frequently. 4. Continue to add the remaining flour, 1/2 cup at a time until the dough begins to leave the sides of the bowl.5. Turn dough out onto a lightly floured board and knead until it is smooth and elastic. 6. Spray bowl with cooking spray and place dough in bowl, turning once to bring greased side of dough up.7. Cover and let rise in a warm place until double in size (about 1 hour).8. Punch down dough, pull edged into center, and turn over in the bowl; let rise again until almost double in size (about 30 minutes).9. While dough is rising, combine zest from one orange, sugar, and cinnamon in a small bowl; spray bundt or tube pan with cooking spray.10. After second rising, form dough into balls the size of walnuts (approx. 36 balls). 11. Roll each ball of dough in the melted butter and then roll in the sugar mixture.12. Place first layer of ball so they barely touch in the bottom of the pan; sprinkle in some of the cranberries.13. Continue to add more balls of dough, sprinkling cranberries in as you go along; when finished combine leftover butter with any of the leftover sugar mixture and sprinkle over the top.14. Cover pan lightly with plastic wrap and refrigerate overnight.15. In the morning, preheat the oven to 350°F; remove pan from refrigerator and allow to stand for 15 minutes at room temperature.16. Remove plastic from pan and bake for 35-40 minutes.17. Invert pan so butter-sugar mixture runs down over monkey bread.18. Make glaze by combining confectioners' sugar and orange juice; drizzle glaze over warm monkey bread and serve. Gorgeous, love the recipe and the photo! I am loving this flavor combo. Sounds so decadent!! Great looking bread. I wonder why is it called Monkey bread. Love the homemade dough, Jill. Great flavors in this! Your bread looks fanastic, especially, with the dried cranberries. I love the cranberry- orange combo. Great picture! My mom has been baking Hungarian Bubble Ring for 35 years, and it's incredible! Your version looks amazing too -- I love the flavor combination you put together. If Jolyn and I come to your house will you make us some???? OMG! This looks SO amazing! I love, Love, LOVE the idea of orange and cranberry in it! BRAVO! @Vicki Bensinger I accidentally deleted your comment: This looks so beautiful and I know it tastes great. It's a perfect company bread especially if having family in town. It's nice to be able to prep the night before to be able to bake and serve in the morning. Hermosa y tentadora con el glasé para decir OMG,OMG,ABRAZOS HUGS,HUGS. @Balvinder Ubi I am not sure why it is called "Monkey Bread" but I think it may be because you can pick and pull it apart as you eat it--like a monkey eats! @Anonymous It depends on who you are! Wow! That's one impressive bundt Jill. Looks fantastic! Ohhh WOW! I can not wait to make this, yummy. ...that is AMAZING! Genius decision going with the orange/cinnamon combination. I so wish I could bake! Love this!! Orange and spice is such a classic combo and ading trh dried cranberries sounds so delicious! We love the orange cranberry combination in this house.... This may be the best looking monkey bread I have seen. I love that you used a sweet bread for it I bet it taste amazing. Oh, I'd love to wake up to this! I'm not a morning person either, but I'd jump out of bed for this bread! Thanks! It looks amazing and it sounds delicious! Jill-this is a "new" for me...also known as Hungarian coffee cake? 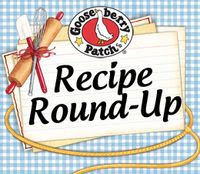 Wow!So far the recipes that I've seen out there were with ready to bake biscuit dough! Your monkey brad with the cinnamon orange, cranberry, and that amazing glaze, is superb! Wow, this looks delicious. I like orange and cranberry combination. No problem. Thanks for reposting it. Looks delicious! This might be the best monkey bread ever! Gorgeous! Wow this looks so incredible! What a delicious mix of flavors. Great variation. The cranberry and orange work very well together. This was so easy to make and it was delicious!! Will definitely be making this again!! Glad to hear it Marie!